Claudia Holzinger of Claudia's Organic Herbs at the Arcata Farmers' Market. 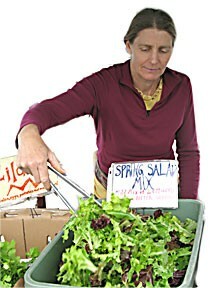 Holzinger grows lettuce, herbs and more with her partner Von Tunstall at their Orleans farm. Photo by Bob Doran. With the Farmers' Market now in full glory, the North Coast community is blessed. How can we make the most of this bounty? When we opened our restaurant, Byrd House, over two decades ago, people warned us that there were "vegetarians" who would look askance at our omnivorous menu. I did not take them seriously. We had, even in those pre-farmers'-market days, access to a variety of local produce from the Co-op and from local farmers. The Potters' Blue Lake farm was in full swing, as were several places in the Hoopa Valley, and we got deliveries from Marilyn at Seaside Herbs. So I made certain to include an interesting salad, pasta primavera, roasted broccoli with garlic and Parmesan and steamed vegetables with a chive beurre blanc. Not good enough, said a handful of vegetarians. They wanted more variety, more complex preparations, spinach lasagna, lentil loaf -- concoctions from The Moosewood Cookbook, a collection of amateurish recipes from a "legendary" restaurant in Ithaca, N.Y. Unfortunately, making vegetarian food that offers the range of flavors available from animal fats is a lot of work. Vegetable stocks require intensive cooking and reduction, and still don't come close to the richness of chicken or beef broth. You'd really have to make it a full-time endeavor. So while we had vegetables, we didn't have vegetarian customers. Too often, in the course of daily meals, vegetables are an afterthought, and indeed, simply serving steamed or sautéed vegetables can make meals dull. For our family, eating more fresh vegetables has been a long-time goal, but one that's difficult to achieve when both people have jobs. There's a limit on how much prep time you want to put into supper after a day's work. So for years we settled on a single seasonal vegetable dish, far short of the recommended two cups a day. And when we had salads, we often didn't finish them -- they were monochromatic, even using various bottled dressings like Annie's. The basic constituents were the same. Boring. Then last summer I decided to create a process that would give us nightly salads so attractive we would want to eat them. I built the recipe from the French model, using small quantities of the best possible ingredients for the dressing, and adding a variety of "goodies" kept in a special refrigerated Salad Bag. Since then, we eat a large salad almost every evening. It's never the same twice, since it borrows from dozens of good restaurants here and abroad. Here is a step-by-step method for a French-style salad, built around ingredients from the Farmers' Market and other things available locally. If everything is set up ahead, it is possible to make an irresistible salad for two in just 10 minutes. And make it different every night. The most important single ingredient is the oil. While we keep half a dozen vegetable oils, the only olive oil as good as the best French ones is Olinda Ridge Master Blend, available at the Co-op in bulk or in 17-oz. bottles at Wildberries for $13. If you three to four times a week, leave the bottle out of the fridge (it will last easily 6-8 weeks unrefrigerated). Do not ever cook with this oil. Beside salads, its rich flavor enhances pasta and bread (instead of butter), and it can be used for sandwiches (in place of mayonnaise). When you first open the bottle, inhale. The Garden of Eden smelled like that. Next is a good, potent but neutral vinegar. The best we know is Trader Joe's White Balsamic Vinegar. Find a vinegar that is 6 percent acidity (most American ones are watered down to 4 percent). Soler Sherry Vinegar is a decent alternative, and there are red wine vinegars called "balsamic," but beware of bargains. There's usually a reason for low prices. This makes about a tablespoon. It will look like too little dressing. It's not. It's just right. More will make a soggy salad. Using a whisk or fork, mix the ingredients into an emulsion (but I've sometimes forgotten to mix them, and the salad turned out just as good). Now add a scant handful of sliced, chopped sweet onion (Walla Walla or Maui), and about 1/2 cup of roughly chopped iceberg lettuce. The iceberg is not a big flavor enhancer, but its texture will provide air and prevent the salad from clumping. At this point we get to the "goodies" -- these are the intriguing little nuggets of flavor and texture that will ensure you don't fill up on meat and bread before eating the salad. I find time to make some of these ahead (for example, I pit dates and pickle pepper slices), but many come ready-made, and need only to be cut and thrown in. The fact that they are all in The Bag means that you don't have to spend a lot of time assembling them. The thing to remember about goodies is 1) don't overdo them -- they are the frosting, not the cake; and 2) balance the flavors -- you are going to have bites of salad that include everything together, so consider how the ingredients fit each other. For example, chunks of pitted Medjool date are great with Cypress Grove Pee Wee Pyramid cheese, but not with diced tomato. These are not my "rules," they are based on what the French do. You want raw sunflower seeds, alfalfa sprouts and raisins, go ahead. But it won't taste the same. No, put away those salad tongs. Get out two salad plates. (Start warm water running.) Using one hand to hold the bowl, and the other to toss, reach into the bowl, and begin gently turning everything. Keep doing this until your touch tells you everything is about equally coated. Then take a big handful from the top and put it on one plate, and do the same with the second. This should be mostly greens and lettuce; the next handful will be mostly additives. In this way, you should be able to divide the ingredients equally, and scrape out the remainders. Chill both plates for 20 minutes before serving.